EEBD (Emergency Evacuation Breathing Device) is a device that is used to evacuate with safety, a dangerous enviroment that lacks normal breathing conditions caused by smoke from fire, gas leaks etc. 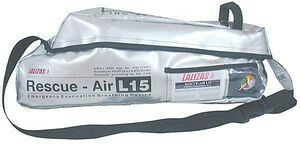 The Lalizas Emergency Escape Breathing Device (EEBD), complies with the amended SOLAS ch.II-2 and the IMO MSC/Circ.849. All vessels on international routes must carry EEBD’s on board. – Ozone resistant – non irritant neck seal.